Ahimsa Beach Villas Situated in the heart of vibrant Seminyak, our flagship residence, The Ahimsa, remains, to this day one of the most sought after offerings in boutique accommodation in Bali. Choose your private villa, available in one, two and three bedroom layouts. Perfect for everyone from travelling couples, to families and groups. The AHIMSA is situated in the heart of vibrant cosmopolitan Seminyak. Choose from sixteen private villas, ranging from one to three bedroom. 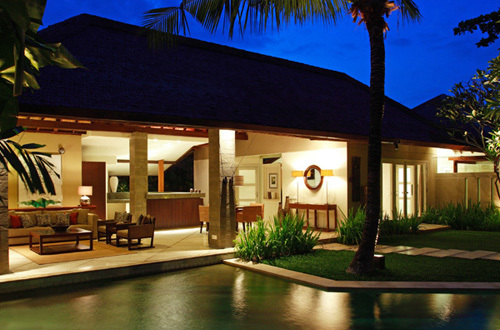 Each property features a beautifully lit, private swimming pool with lush tropical surrounds. En-suite bathrooms, full-service kitchen, state-of-the art entertainment systems, open plan lounge and dining areas, ensure your every need is catered for. Our villas are strongly influenced by ideals of tropical, outdoor living. The use of local materials in the choice of interior fitments ensures the indelible spirit of Bali is captured in all its grace and beauty. The Ahimsa is a dream come true. Your own cook, your own driver, your own maid. In fact, anything you want, when you want it for the time of your life during your time, at the Ahimsa. Team Culinary is very fond of cooking. They'll happily prepare you're a la carte breakfast every morning as well as any other special meal requests you might have for those days or nights you prefer to stay home and enjoy the quietness of your villa. You shouldn't checkout of the Ahimsa until you have enjoyed one of our famous poolside barbeques. These succulent feasts feature seafood freshly caught locally and prepared in authentic Balinese style. We'll do all the work for you in the privacy of your own villa. All you have to do is grab hold of a cool drink and get your taste buds ready for a savory treat. Is there a better way to see and learn about Bali than being ushered around by your personal Balinese tour guide? We don't think so. Choose from a number of tour options and let Made, Ketut, Komang, or Wayan take you on an enchanted tour of their home island. If you pefer to do your own driving, the Ahimsa can arrange a car to be delivered right to your front door. Bali is an exciting adventure location with many land and water activities. Enjoy scuba diving or snorkeling within one of Bali's pristine coral reefs. Bali is also home to a number of rivers, which boast class I - IV rapids. Rafting tours are available year round. We can provide complete packages for any number of adventure tours or cruises. It's Pamper Time: Why go out and about searching for that perfect spa treatment when we can arrange for it to come to you? From in house massage and reflexology to manicures and pedicures we can stimulate and sedate you from head to toe all within the privacy of your own villa. A wide variety of treatments are available for your picking. Go ahead, you deserve it. The Ahimsa provides babysitting for guests who may want to spend a few quite moments away from the kids. Reliable and responsible sitters will look after your loved ones while you enjoy precious time on your own. If you've gone mad and come to Bali to actually work, in each of our villas you can attend to your business matters in your personal business suite. Complete with internet and phone access, the business center is the perfect location to complete your business needs. In need of more personal communication? We can arrange cellular phone rentals so you can be in touch even while you're not in your villa. Go ahead, do it. Our housekeeping staff is always on call and will cater to your every need day or night. We offer one bedroom villas , two bedroom villas and three bedroom villas, each of our villas feature private entrance, air conditioned bedrooms, swimming pools and gardens, fully equipped kitchens, stereo systems, satellite televisions, and IDD telephones. The Ahimsa provides Airport pickup and transfers, private housekeepers, cooks, same day laundry service, grocery shopping and restaurant delivery services, personal drivers, car and motor bike rentals, babysitting and catered private parties. The Ahimsa has 24 hours reception and security.